Bulgarian Eastern Orthodox Diocese of the USA, Canada and Australia. 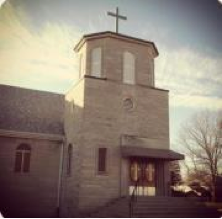 Welcome to the web site of St. Stephen Bulgarian Eastern Orthodox Church. Here, you can discover information about our parish, culture, and Orthodox Christianity. We hope that your journey here will be educational, informative, and spiritual. The first church was begun in 1915 at Blackford St. across from Military Park in downtown Indianapolis. During WWII our congregation began to move to different parts of the city. In December of 1954 construction began at our present location at 14th and Medford. The church was completed in 1955. On October 14, 1962 our church was concecrated by Metropolitan Arch-Bishop Andrey. We celebrated our 100TH ANNIVERSARY with a GALA CELEBRATION on Saturday, September 12, 2015 at the Indiana History Center on the canal in downtown Indianapolis. Metropolitan Joseph, Bishop Daniil, Fr. Dimitur and six other Orthodox priests celebrated with us. The event was sold out. Our church was one of five original churches begun in the United States and Canda under the Bulgarian Diocese. We are currently celebrating our 103rd ANNIVERSARY as an Orthodox beacon in our community. Primo Banquet Hall was the site for our dinner/dance this year.